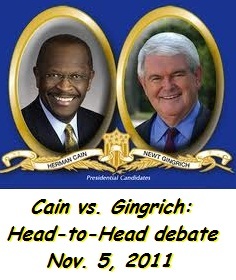 This debate on Saturday, Nov. 5, 2011, had Herman Cain and Newt Gingrich in a one-on-one matchup. It was hosted by the Texas Patriot PAC and held in Houston Texas; moderated by Iowa Congressman Steve King. Herman Cain: CEOs must get involved or free market system will collapse. Newt Gingrich: Businesses focus on customers; apply Lean Six Sigma to gov't. Herman Cain: Require photo IDs to vote, to end fraud. Herman Cain: Medicare cost 9 times its originally promised cost. Herman Cain: DC can't solve healthcare costs; use market driven ideas. Herman Cain: Block grants to states & partial vouchers to people. Newt Gingrich: No mandatory premium support model; give people choices. Newt Gingrich: Medicare pays crooks; contract it out to private companies. Newt Gingrich: Block grant Medicaid; create individual incentives & bonuses. Newt Gingrich: Sue the federal government for every cent spent on illegals. Herman Cain: Limit unemployment to 26 weeks at first, then half later. Newt Gingrich: Go to college instead of 99 weeks of unemployment. Herman Cain: Old ideas prolong problem; use personal retirement accounts. Herman Cain: Let people decide how to invest their Social Security. Newt Gingrich: Get social security out of budget; make personal accounts. Herman Cain: The media give out misinformation; a disservice to America. Herman Cain: Change entitlement to empowerment programs. The above quotations are from Head-to-head debate between Herman Cain and Newt Gingrich.